Austin&apos;s lineup of major employers reads like a who&apos;s who list of tech world masterminds and groundbreakers. We&apos;re the full-time home to a rich mix of established industry leaders and startups, including Apple, Dell, IBM and Google as well as UT Austin - a top 100 public university with the new Dell Medical School which opened in June of 2016. 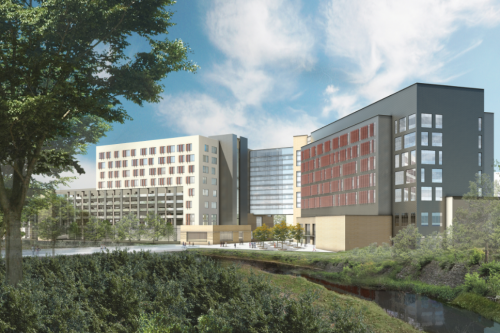 UT Austin&apos;s largest and most intense construction project in decades, the Dell Medical School at the University of Texas at Austin is redefining the face of medicine. The brand new school - built from the ground up at a top-tier research institution - is transforming the way people get and stay healthy, catapulting Austin into a model healthy city. Dell Medical School was created on an unprecedented partnership with local taxpayers, and is focused on creating new curriculum, putting the community at the forefront and transforming the future of medical education and care in Texas and beyond. Medical meetings in Austin benefit from easily accessible experts and speakers in unique and inspiring areas such as the new Design Institute for Health. "The best way to grasp the transformative impact of this project is to see it up-close - the advances in healthcare delivery and design that the school pioneers in this community will have implications well beyond Austin&apos;s city limits," says Stephen Scheibal, Director of Media Relations for Dell Medical School. The school has recruited leaders in traditional medical education sectors as well as leading-edge areas such as health care redesign, population health, informatics and design - these and other ambassadors are frequently available for presentations to groups, Scheibal adds. Since the Dell Medical School opened in Summer 2016, there have been plenty of opportunities to tour the facility and learn about the groundbreaking innovations taking place. Check out Why Austin for more reasons why Austin is the it place for medical and tech meetings and conventions. American Association of Immunologists, Inc.